This weather-resistant Sunface Wall Decor cheers up any indoor or outdoor space. The sun is always out when you display this novel sunface plaque outdoors on a patio wall, gate, or by the pool. (Mounting hardware is not included). 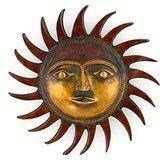 Sun wall sculpture is used for career development and attracting harmony in the home and office. It is the easiest way to set the environment full of positive energy. It can be hanged up on the wall so it is called as Sun wall. It is also used to get happiness from the children and belongings. Brass Sun wall Art is very easy to use and decorate the wall. Size : 5 Inches Height X 5 Inches wide X 2 Inches depth , Weight : 400 Grams , Material : Brass. -------------- Pls beware from Copy product & ensure buying authentic product. This is exclusive inhouse design & product of Brand "Collectible India" and "covered by intellectual property rights laws". 'Collectible India' doesn t authorize any other Brand/Seller to sell it and we won't be responsible if any counterfeit or substandard product send by any other seller.